Web Image Converter has really flexible settings. To access them go to "Tools > Web Image Converter Settings..." in the Internet Explorer menu. When you click this button you see this dialog. The settings dialog box has 3 tabs: "Image Settings", "Sites Settings" and "Other". The "Image settings" tab allows you to set convertion options for images. On this tab you choose between Simple and Advanced Image settings. Simple Image Settings provides you with the most common settings for convertion. Here you can choose image quality and image size from available values. 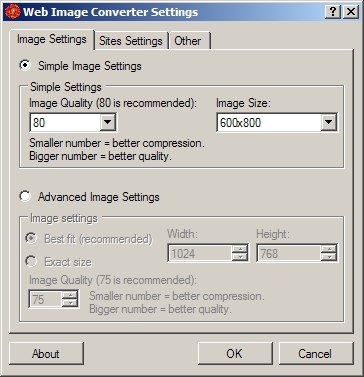 Advanced Image Settings allows you to select any image size and any quality. Also it allows you to choose between resizing types: "Best Fit" or "Exact size". Image quality is detetmined by number – the bigger the number, the better the quality. At the same time, when you select a better quality, the converted image file will be larger. An image quality of 80 provides great quality and a good size. An image quality of 100 is not recommended as the size may be to large for most sites. Image size defines width and height of a converted image. Best Fit – the image will be resized to keep the original proportions. In this case, the image size can vary from the selected value. Best fit is always used in the Simple Image Settings mode. Exact size – the image will be resized to have exactly the same width and height as selected in the image setting. It's not recommended to use this option, because it can significantly change the image.